and transfer to your hotel for taking rest. 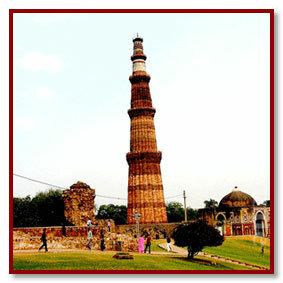 This morning, we proceed on a guided tour of new delhi & old delhi covering birla temple, india gate, pm house, lotus temple, humayuns tomb, red fort, qutab minar, gandhi memorial, jama masjid. and chandni chowk (by walk or Cycle Riksha)-one of the main oldest market of the delhi. overnight stay at hotel. 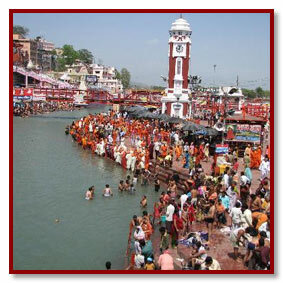 Early morning transfer to the train station to board your train to Haridwar or by car drive to Haridwar. Check in Hotel. In the evening visit Har ki Pauri to view the holy Ganges Aarti. This is the place where the main bathing takes place. The place is called Brahma Kund, the myths says this is the place where the nectar can dissolved in the holy water of river Ganges. 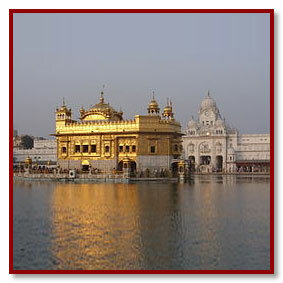 If wish, have a dip here later after viewing Aarti visit the market near the place. Later back to your Hotel for night stay. Rest of the day at leisure for own activities and to enjoy the facilities of the resort. Proceed for an excursion trip of Rishikesh, Rishikesh is a holy city for Hindus located in the foothills of the Himalaya in northern India. Legend states that Lord Rama did penance here for killing Ravana, the demon king of Lanka. It is also known as the gateway to the Himalayas, Rishikesh is the starting point for traveling to the sites that form the Char Dham pilgrimage in Rishikesh visit the magnificent ashrams and famous Ram Jhula and Laxman Jhula. Meeting and assistance at Pathankot train station and drive to Dharamshala a very scenic and peaceful hill station which has the added attraction of its strong Tibetan influence. It was here that the Dalai Lama and his followers had fled after the Chinese invasion of Tibet. Upon arrival, check into Hotel Surya. We visit the Norblinga Institute for Tibetan Buddhism which is perhaps one of its best in the world. The Institute has its own temple, museum, hospital and meditation hall. We would meet with monks here to learn more about Buddhism. Of special mention here are the magnificent miniature paintings done by students here. It is great to see the students sketch a design and then paint it on canvas.. We would visit the Dalai Lama’s Palace and temple in the afternoon and meet with the spiritual leaders to know more about the plight of Tibetans, their future, the problems they face in India etc. If the Dalai Lama is their in Dharamshala at the same time as we are, every effort would be made to have a personal audience with him, the Tibetan Buddhism’s deity of Universal Compassion. It is special meeting him, not because of his title or the high degree of reverence that the people of Tibet hold him in; but more because how it feels in his company. Several strong impressions remain about the meeting, including the way in which he gives his whole attention to questions. There is wisdom in his thinking which comes through clearly in his words, filled as they are with common sense and realism. His firm handshake, his sense of compassion, his sense of humour, his highly infectious and kind laughter are some of the everlasting images of the Dalai Lama. This morning we would visit a residential school run by Tibetan refugees. It is heart rendering to see how these helpless people over the years have struggled to be self-sufficient. The love and compassion that exists between inmates is only to be seen to be believed. We would also visit the Tibetan crafts village where Tibetan refugees are imparted training for making various handicrafts, carpets as well as tailoring. Upon arrival and transfer to your Hotel. Established in 1963 by the scion of a pioneering family, Hotel Ritz Plaza has undergone recent transformation (1999). This hotel has many firsts to its credit - being the first centrally conditioned hotel in Punjab. In its own history it has hosted a galaxy of who's who, including a visit by the Queen of England. The hotels refurbishment aimed at modernizing and adding comfort to a home steeped in history. The most holy Sikh shrine, The Golden Temple is just 10 minutes drive from this Hotel & it is 21 Kms from the Wagha Border check post with Pakistan. 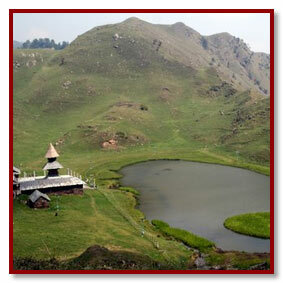 The hotel is a perfect base for these as well as for sojourns to the Himachal and Kashmir Hills. After breakfast we visit the Golden Temple, which is the Mecca of Sikh religion .The temple with a shinny pure gold dome, is beautifully situated in the center of a lake (The Holy Tank). And is approached by a causeway. All around the lake are marble walkways and various other temple buildings. The community kitchen, which feeds over a thousand people continuously, is spectacular. The huge utensils to prepare the food and the chapattis (breads) - 20 to 25 at a time - are a mind-boggling sight. However, besides the physical beauty of the place, the strong and tranquil spiritual atmosphere of the place is soul stirring without being overwhelming. The constant recitation of the holy book brings a certain sense of peace to the individual. We walk through the temple complex and try soak in the atmosphere. We would also have an opportunity to meet some Sikh religious leaders who would talk to us about the basic tenets of Sikhism. Afternoon is at leisure for independent activities. We suggest you visit the Gandhi Gate parts of the old city. It would be fascinating to witness the traditional homes and bazaars continuing over generations. We would also suggest that you find your way back to the Golden Temple to explore and appreciate the spirituality of the place at your own pace. Of special mention would be the community kitchen which feeds over 5000 people at a time throughout the day. The pots and pans would surprise you! It would be fascinating to view 5 women make breads on a flat pan. Transfer to the International airport to board your onward flight.